Plants and other photosynthetic organisms experience frequent changes in environment. Their ability to survive depends on their capacity to acclimate to such changes. In particular, fluctuations in temperature and/or osmolarity affect the fluidity of cytoplasmic and thylakoid membranes. The molecular mechanisms responsible for the perception of changes in membrane fluidity have not been fully characterized. However, the analysis of genome-wide gene expression with DNA microarrays has provided a powerful new approach to studies of the contribution of membrane fluidity to gene expression and to the identification of environmental sensors. 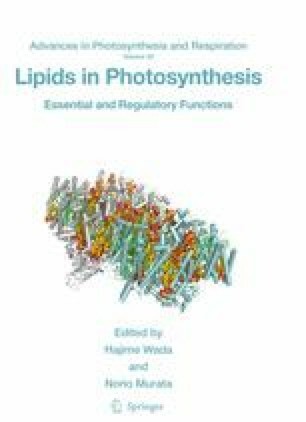 In this chapter, we summarize the knowledge on the mechanisms that regulate membrane fluidity, on putative sensors that perceive changes in membrane fluidity, and on the subsequent expression of genes that ensures acclimation to a new set of environmental conditions. This work was supported, in part, by grants from the Russian Foundation for Basic Research (nos. 09-04-01074 and 07-04-00117) to Dmitry A. Los and Vladislav V. Zinchenko, and by a grant from the “Molecular and Cell Biology Program” of the Russian Academy of Sciences to Dmitry A. Los.